The designation – the multinational people of Kazakhstan is not an empty phrase. It is primarily one of the terms of real politics, which takes into account all aspects of life of Kazakh society and reflects the objective state of general civil, legal and cultural identity of the population. It is important, that most people of Kazakhstan ethnic groups were formed as a result of ethnic interaction and cultural influences in the course of historical development and in a result of complex social and migration processes. The main is achieve the peace, harmony, mutual respect and tolerance between ethnic groups (nations and nationalities), living in the country. It is important to build on the significant and loyal postulates, like peace, friendship and creativity. The Assembly today is a constitutional member, headed by its Chairman, at the same time by the President of the country, the guarantor of the Constitution – N.A. Nazarbayev. By the fact the deliberate and systematic policy to the years of sovereignty reached (in the political, economic and social spheres) the previously unseen heights and achievements. It enabled Kazakhstan to appear on the world stage as a country with a diverse cultural life, which is the public domain of our entire country. The phrase – one nation is one country and is one destiny, including the idea of multi-ethnicity, tolerance and inter-ethnic harmony. It has found its clearest reflection in the Strategic Concept of Kazakhstan for the year 2050 that the Kazakhstan became a free territory of ethnic conflicts, which led to the successful implementation of social and political economic reforms. Today our Republic is one of the prosperous countries of Central Asia and takes its place in the sustainable global context. One of the most important mechanisms of the harmonization of inter-ethnic relations is the promotion of the most complete and accurate knowledge of the ethnic communities, living in our country. This knowledge will help to overcome xenophobia and negative ethnic stereotypes, also they enrich the spiritual-aesthetic world of our citizens, form the installation on international consent and cooperation, personal contacts and cultural interaction. In order to understand the characteristics of the current situation of people of Kazakhstan, it is necessary first of all to knowing their origin, ethnic history, life, character, psychology, mentality, and their spiritual culture. Unfortunately, the mirror of the soul of any nation – is the spiritual culture, including the most important it part – the ethno-musical art, which verbal communicative language is accessible to all and has long remained in the shadows. The individual reports about the activities of cultural centers, the rare articles in the media and on the websites, the brief analysis of the works of individual artists in the publications, devoted to the study of the musical art history of numerous national cultures are given only sketchy ideas about the art considered nationalities. The music is a common language of many nations and people. The same postulate is good-sounds to friendly Kazakhstan. There are more than 100 ethnic groups live in this country. The ethnic diversity represented by the Turkic, Iranian, Caucasian ethnic groups, as well as Slavic, Finno-Ugric and other ethnic groups. Together, these groups are the ethnic groups of the Eurasian continent. The most popular are: Kazakh, Russian, Uzbeks, Uighurs, Ukrainians, Tatars and Germans. In percentage terms, they account for about 95% of the population. The increase in the number of Kazakhs is not only due to natural growth, but also due to migration influx of ethnic Kazakhs repatriated – repatriates in the territory of the republic. During the Soviet times Kurds were settled in Azerbaijan An area was located between Nagorno-Karabakh and Soviet Armenia. Despite a dedicated piece of land, the Kurds repeatedly underwent a wave of deportations. The Kurds are very musical. This is reflected in their ethnic music. Their attitude to art pronounced in their melodies, songs and in their various forms, genres and structures. The sense of rhythm plays a peculiar role in the sketch of an action. The most important rites of the Kurds are dawat and sunat. It’s mean the first is a wedding; the second is the rite of circumcision. In certain calendar period the wedding of Kurds last for weeks. Participation in them — is not only a tribute to tradition, but also a unique form of communication, rehabilitation, psychological recharging. In ceremonies attended by all and the elders and children. The song genres, as the Kazakhs are divided into several groups (customs) – wedding, funeral, songs dedicated to the birth of a child, songs, and other spells. A special role is played by the Kurds song-dance – govand – Kurdish dance, which is a massive semicircle, literally translated from Kurdish as a step. Govands are divided into male and female, for the old and slow. But they all have a certain temperament and plot. 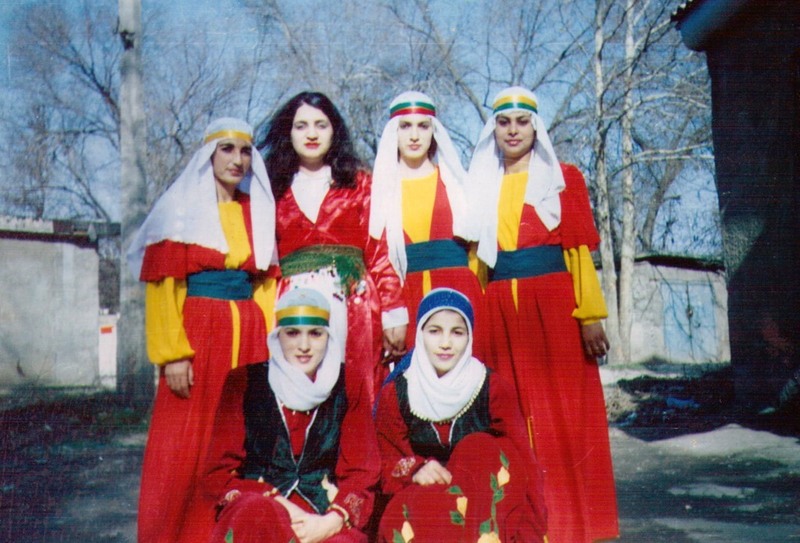 It’s important to have an element in the performance of a Kurdish dance steps and timing. The Kurdish lyrical songs, take as their own special niche. These songs are rarely sung about happy love. Love theme is sad and sorrowful of expression. This coloring is a due to the fact that the girl’s parents rarely give her daughter’s beloved. The fate of the young men also depends on the elders. The text of lyrical songs is a couplet with repeat phrases. It’s painted with minor shade, with Phrygian turnovers. The extant ritual songs of the Kurds, especially Yezidi Kurds have different contents. Their analysis shows that in the ritual songs revealed the ancient folk belief and connection with the cult of the dead astral religion. 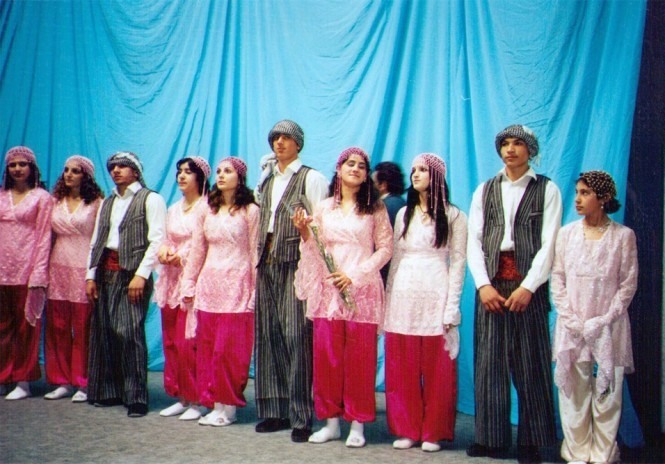 The famous Kurdish ensembles in Kazakhstan are the folklore-musical and dance group «Sterk», the folklore groups «Nur-Ali», «Bakhchen gulan», «Alan», «Zilan», also the popularity between Kurdish folk ensembles are having dance groups like «Midiya», «Mesopotamiya», «Bakhar». An important indicator of the importance of music in the lives of the ethnic group is its regular, widespread reproduction. Every member of society produces music, thus becoming its performer and its creator. The traditional music for the Kurds is a huge part of their spiritual nourishment, a powerful energy source that supports ethno-cultural unity. Thus ethnic and confessional structure of the population formed the cultural and civilizational system of social diversity. The combination of Islamic, Orthodox culture with features of nomadic, a settled agricultural traditions and customs allows to elaborate a specific set of philosophical, political-administrative and socio-economic relations.